The Winter 100 is the final event of the Centurion calendar year and the last event which makes up the Centurion Grand Slam. The event involves 4 x 25 mile out and back legs along sections of the Thames Path and Ridgeway. 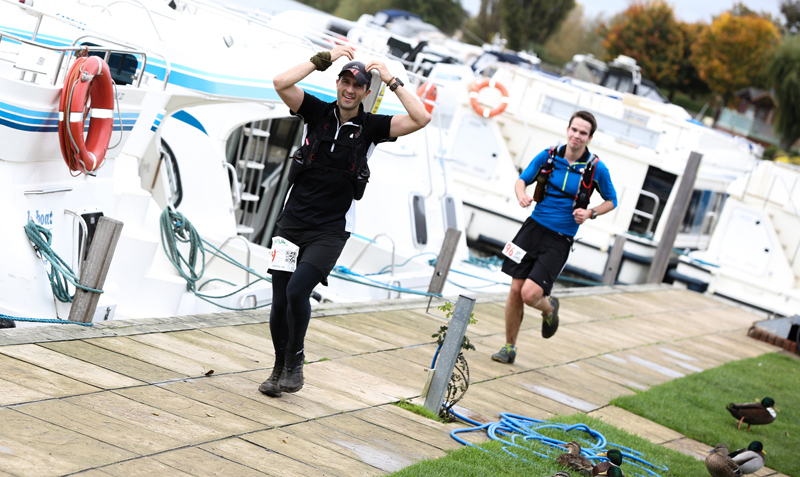 The race was first run in 2012 and at the time was held towards the end of November but was impacted by flooding of the Thames and had to be re-routed (and it rained constantly for about 17 hours I recall) and the event was subsequently brought forward to mid-October. I knew I needed to get into better shape for the final event of the year having not really put any long training runs in (i.e. anything over 15 miles) since before the Thames Path in May due to a sequence of racing/recovering/tapering and family holiday/work/life over the summer months. I knew my fitness over a long distance wasn’t where I wanted it to be and so a week after the disappointment of the T184 I was completing the first 25 mile recce of the Winter 100 with Nicole Brown (thanks for being my regular running buddy in the build up) along the Ridgeway and we were then joined by Paul Radford and Fiona McNelis on subsequent weeks as we ran a 25 mile leg most Sundays. I also had the pleasure to meet up with the awesome Team Consani one week and I recce’d a leg with Debbie and Karen Hathaway (who kindly didn’t rub the T184 result in at all… Karen won the race outright!). The training didn’t quite go 100% to plan as I continued to experience a few minor niggles (sore knees and sore Achilles) which was symptomatic of my year to be honest. I also suffered a sprained ankle three weeks out from the race when running with Paul Radford, which saw me having to hobble 10 miles back to my car. Despite not hitting the mileage I wanted to and having to take a few days of enforced rest I did get all my long runs completed each weekend and also completed the Purbeck Marathon and my final run at the Longmynd Hike two weeks out from the race which then gave me a couple of weeks of rest all my niggles, taper and rest. In summary, I was feeling 90% fit but not quite the 100% fit I had felt prior to the Thames Path 100. In the few days before the race I had a bit of extra motivation (pressure) with a little fun bet with Nici Griffin. Several of you may be aware of the “lucky hat” which I started wearing at all my events a few years ago and its unfortunate association with wet weather that always seem to follow it.. at each and every event. 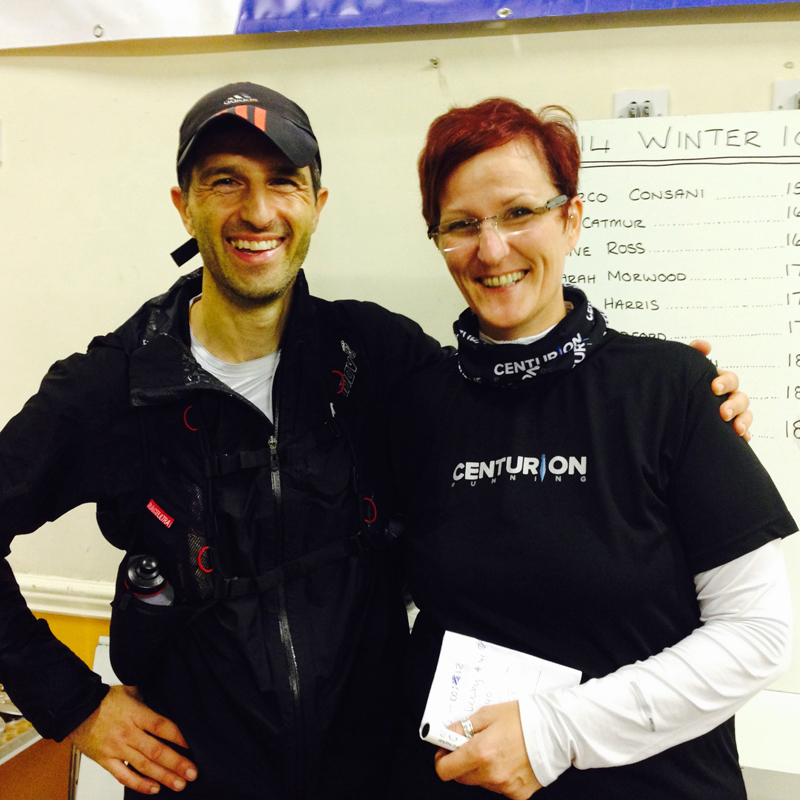 As I have run a few Centurion events, they have been particularly unlucky with some of the weather conditions (2012 Thames Path – race abandoned, 2012 Winter 100 – 17hrs of constant rain, 2013 Thames Path – flooding resulting in a diverted route, 2014 North Downs Way – the remnants of Hurricane Bertha) in particular. If I ran 20 hours or over, Nici would get to keep (or burn I think was the likely outcome) “the Hat”. If I ran a sub-20 then Nici would agree to run a 100-mile race. I’ve run about 15 races of 100 miles distance or longer and 7 specifically at the 100 mile distance. I’ve only ever run a sub 20 once which was a 19.36 set at the Thames Path 100 earlier this year. Whilst I had a certain degree of confidence I could run the time (as my finish times have improved a bit year on year) this was by no means guaranteed. Essentially, it was a fair bet with a certain degree of risk for both parties which is exactly how it should be. We posted details of the bet on the Centurion Facebook page which generated a bit of interest from people and resulted in some mock banter between us both in the lead up to the race and on race days itself. 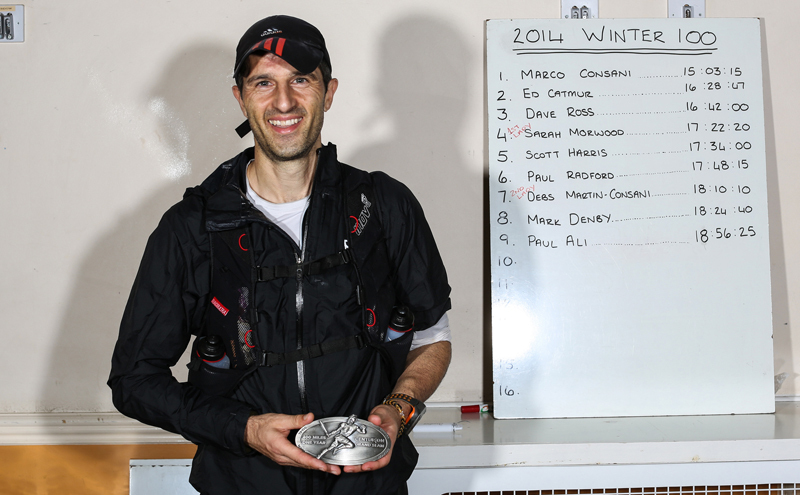 The Winter 100 is a local event for me and I live a 20-minute drive from the start and knowing (and having run) each leg which gave me a little advantage. I arrived at the start of the race in plenty of time to some jibes and banter and mock threats of “random kit checks” at every checkpoint. Nici and I caught up before the event and the banter began pretty quickly as I recounted to Nici my Daughters last words as I left the house that morning “Daddy, I don’t want you to lose the hat”…. Yeah it was a pretty cheap shot early on in the mind games! In tennis terms it was 15 – love to me. The Sub 20 plan for the day was 4hrs for leg 1; 4-5 hours for leg 2; 5-6 hours for leg 3 leaving me with 6 hours for leg 4. If I could get back to Race HQ at the 75-mile point by midnight (14 hours in) then I was fairly confident I could march out the final leg in 6 hours. I gave Nici the heads up for my plan in confident terms… 30 – love to me. Nici was predicting a 22hr finish for me and then recounted her plans for the ceremonial burning of the hat after the race had finished. Damn, point Nici’s, 30 – 15. I heard the rest of the Centurion team and volunteers had been joking with her and were helpfully researching possible races for her the night before! I was assuming there would be a lot of banter and exchanges with runners and volunteers and I wasn’t disappointed at all. I spoke to several familiar faces and a few new ones at the start and then walked to the start point with Shawn. A different mindset was needed today and rather than assume my typical position somewhere near the middle to back of the field at the start and then working my towards my general pacing group, I elected to start near the front with fellow club runner Wendy Shaw. It was Wendy’s idea to go for a fast (but not quite suicidal) but comfortably quick pace and we set off near the front of the field. I also made a decision not to hang around at Aid Stations and not to waste time tweeting or Face booking at all. The sacrifices I had to make for this race you know…. it wasn’t easy…. Wendy and I dressed like ninja’s. We set out quite quickly from Goring, west along the Thames Path towards the turn point at Days Lock. About a couple of miles in I called a couple of runners back who missed the left turn by the Pub and then ran chatting to Wendy and Dill mainly as we held an 8m/m – 8.30m/m pace on the outward leg not bothering to stop at the first Checkpoint (apart from having your number recorded). This leg was a mixture of muddy paths, fields and some road. The ground conditions were a little tricky in places with my Invo8 Race Ultra 290’s not having the best grip and there were a few stumbles with Peter Bowles going down after Benson followed by me over a small wooden bridge which was wet and slippy. The lead runners were already on their way back as I was a mile or so away from the turn point and it was great to see the top guys in action (the girls would overtake me a little while later into the race). After a quick stop and a quick water refill on the turn point it was back on the return leg. About a mile into the return leg Ian Thomas stumbled and went down pretty hard and I stopped briefly to help him, fortunately he managed to carry on albeit a bit gingerly at first. 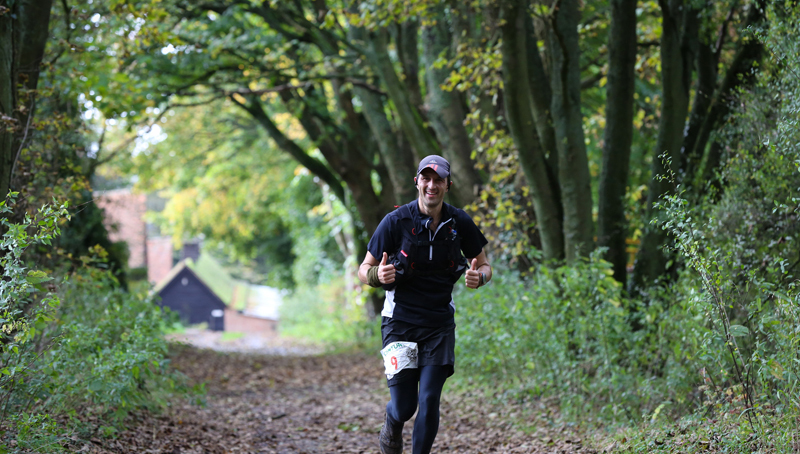 I continued on passing stream of runners coming the other way and giving a wave, hello, high five or a well done and headed back towards Goring. A few of the runners reciprocated with “Go The Hat!” type shouts which was much appreciated. Whilst 4 hours for the first leg had been my target I wanted to be a little bit ahead of this just to put some early pressure on Nici. 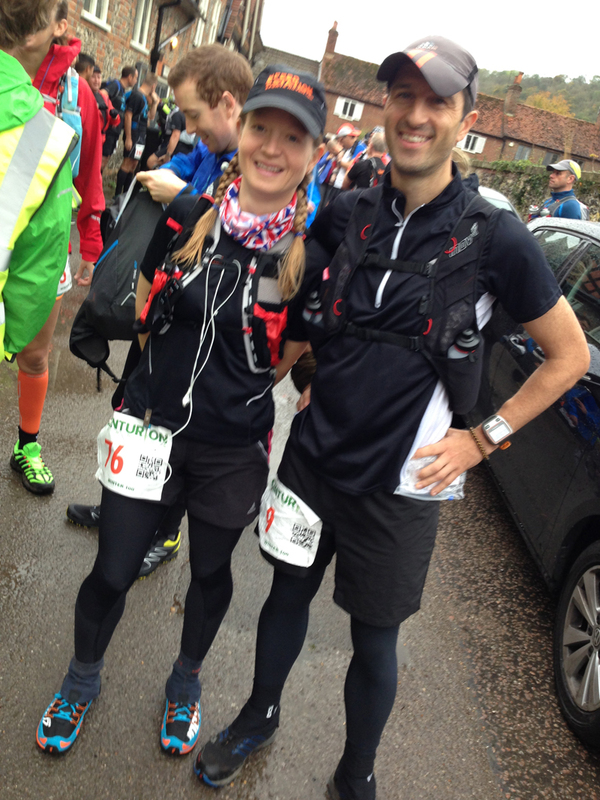 I arrived back in Goring in 3.37, in 14th position. 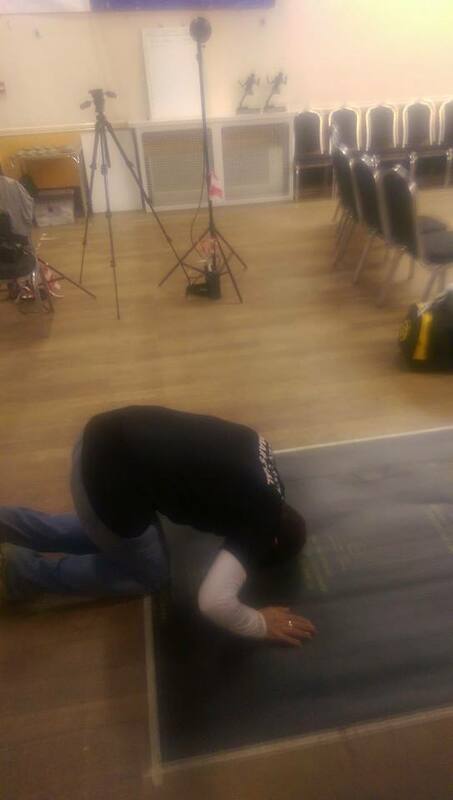 As soon as I entered Race HQ the volunteers were immediately winding Nici up. “So, twenty minutes up on schedule!” I beamed to Nici as I grabbed a few snacks, refilled my bottle and headed out the door for Leg 2. No messing about here, game on. I think I headed out of the Aid Station ahead of a few others and gained a few positions here. The second leg saw runners follow paths and pavement for a mile or two before following the Thames river for a couple of miles after which it’s more of a traditional trail route covering subtle gradual incline through bushes, trees and more wooded areas. The weather was overcast and cool but there was some sunshine and this was a great leg to run particularly on the turn when it felt like there was a lot of downhill. I ran by myself for a few miles passing through the interim Aid Station which was being manned by Jen Bradley and a few others and grabbed a few snacks and a drink. I had cut my arm somewhere possible after stumbling around on leg 1 and had a line of dried blood running all the way down my arm. One of the Centurion volunteers pointed this out to me and asked if I needed any assistance which finally… finally allowed me to use the Jesse Ventura (Predator 1987 boys action film) “I ain’t got time ta bleed” line as I headed out the Aid Station. I’ve only been waiting 25 years to use that in a real life situation. Scott Harris caught me up and we ran together briefly before he moved on ahead and Sarah Morwood also passed me running the section before Grims Ditch. I was pretty impressed each time I saw Sarah on the course, she was absolutely relentless with her continuous pacing each time I saw her and looked really positive. A superb Ultra running talent (she came 4th overall in 17.22). Ed and Marco passed me on their way back running neck and neck at breakneck speed and Dave Ross was in 3rd position about 15 minutes behind them. I passed through the Grims Ditch section, through the Golf Course and then crossed the road about a mile away from the turn and crossed through the two ploughed fields before I spotted another runner not too far ahead who I caught up and realised it was Paul Radford. 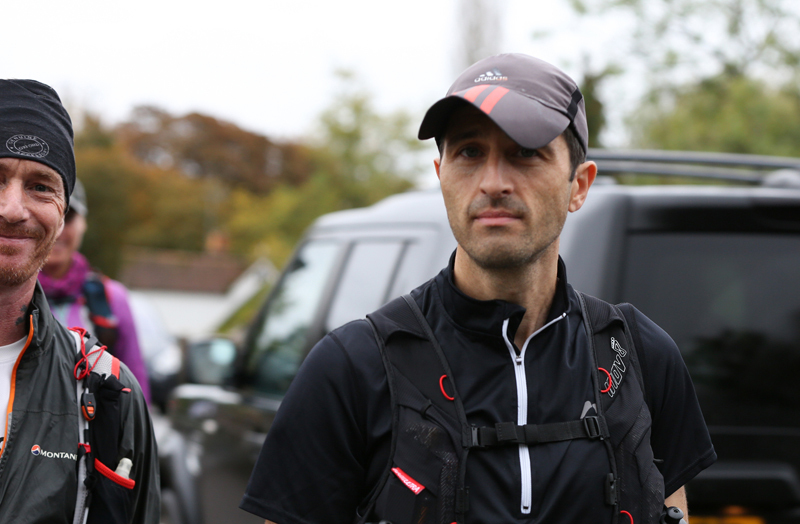 Paul mentioned he had a bit of injury trouble which I suspected as I was expecting to see him further ahead and I made some quip about getting further than our recce run on a few weeks earlier. As we approached the Checkpoint another few runners including Ryan Brown, Scott and then Sarah were coming back in the opposite direction. We both grabbed a few snacks and a drink refilled our bottles before heading out together. 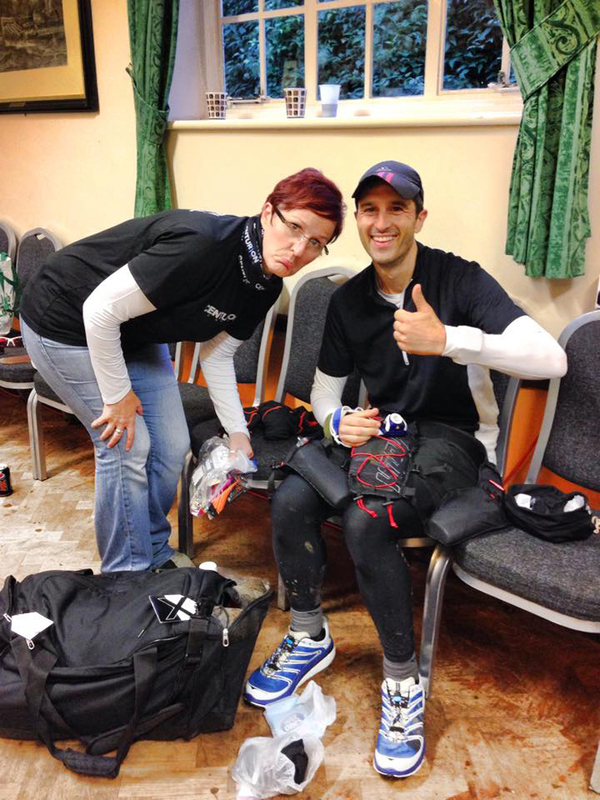 We ran together for the next few miles over some really runnable slightly downhill terrain making some good pace until I heard a scream behind me as Paul had stumbled over and aggravated his injury. It was uncomfortable for him at first but carried on and a few miles later drifted ahead of me. The downhill gradient (and Paul’s company) on the return leg meant I was quicker on the way back clocking sub 10m/m for most of the return leg. 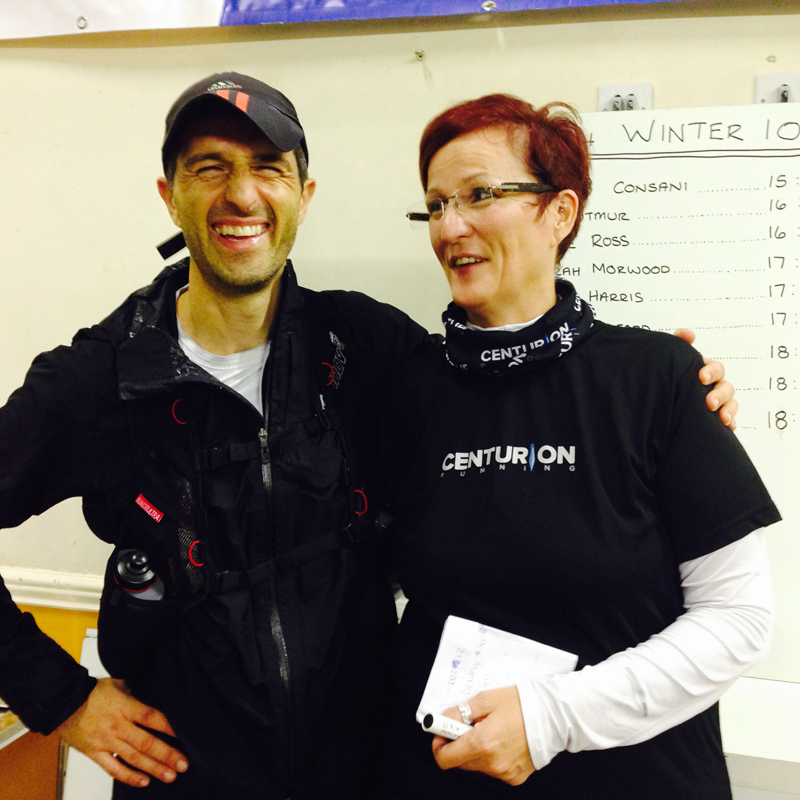 I hadn’t realised it at the time but I was in 8th place at the 37.5-mile point which was confirmed by a text from Matt Dunn who was keeping an eye on the Centurion tracker. I spotted Karen Hathaway a few times as she out supporting Debbie and appreciated the shout out as I passed her. I ran briefly with Warwick Gooch who I don’t think I had met before but I had spotted his name in the Centurion rankings (way ahead of me) on a number of occasions and it was good to put a name to a face. I think Debbie also overtook me around this point not too far from the Goring Aid Station. Stouty had kindly agreed to pace me for a leg and he was planning to meet me at the 50-mile point. I had told him to be there for 6pm as I would be arriving between 6-7pm (8-9 hours). In fact I was actually going to get there just before 6pm (and before it was dark which was also a little objective) and I slowed to a walk as I phoned him to warn him but didn’t get through. Thankfully, Stouty had the presence of mind to check the tracker and saw I was doing ok and was there when I arrived. I’m quite relaxed about having a pacer. It’s great to have a bit of company on a run but equally I feel comfortable running by myself for long periods. We had agreed Stouty would run leg 3 which meant it was a Saturday evening run and I felt this was the critical section of the race. As I approached the Goring Aid Station and the sun was starting to set on the horizon I saw Kate Hayden and family out on a walk supporting John and jogged the last couple of miles eventually arriving back at Race HQ. 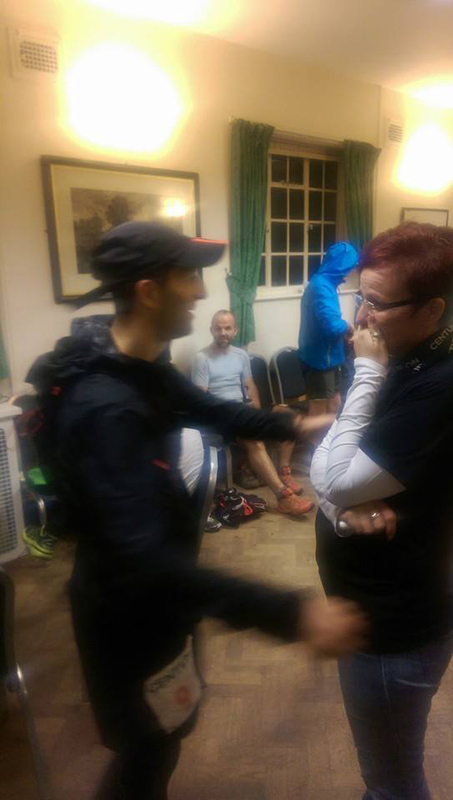 Nici came over and cursed me as I let her know I had just set a new 50-mile PB time (honours even with that exchange). Stouty was there but needed to get changed and I told him not to worry as I was ahead of schedule and could wait around for a few minutes if he wanted. (40-15 to me I believe, as Nici glared at me again). I was feeling motivated and in control of my destiny but you don’t run a PB pace without having a few aches and pains but there was no way I could show any weakness in front of “the enemy” (Nici). I then proceeded with my planned change of shoes at the halfway point as James Adams wandered to say hello just as I pulled out my Hokas from my bag….. Damn, what did I say about showing weakness to the enemy?… wait for it… wait for it… and then James delivered some quip about the Hokas. Hokas are like marmite, people seem to love them or hate them. I am currently experimenting with them as I do suffer from bruised and battered feet. 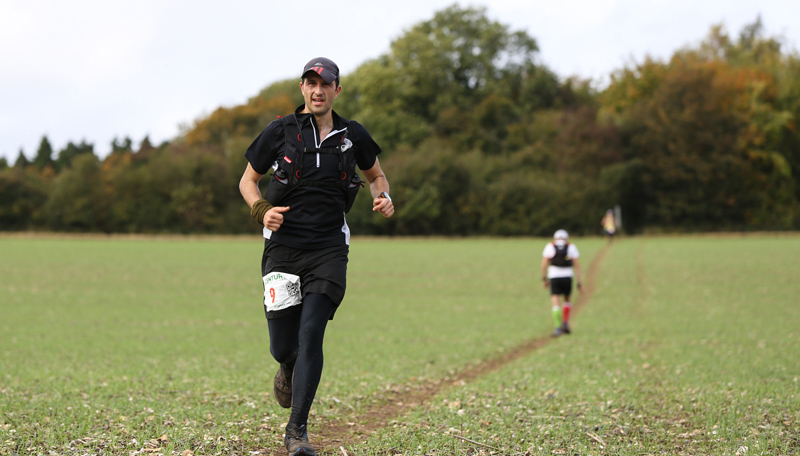 In fact the last time I ran the Ridgeway Challenge in 2012 I had sore feet for a couple of days after and so anything which would help cushion my feet were a bonus. I changed into my Hokas, put on my base layer as Stouty finished changing and we set off for the third leg in 9th position. I spoke to Ryan Brown who unfortunately had to drop from the race after aggravating an old injury which was disappointing as he had run well at that point and was placed quite highly at the time. I could immediately feel the benefit of wearing the Hokas. A few minutes earlier my feet had been feeling bruised and sore and then I could hardly feel a thing. In my training runs I didn’t really appreciate the level of cushioning as the training runs didn’t tax the feet too much but when I put them on after 50 miles of solid running.. well difference and cushioning is really noticeable. Safe to say that I may be using this tactic again. The plan was to run the flats and downs and hike the gradients for the next leg and see if we could get complete this leg in around 5 hours which would give me a comfortable 7 hours for the last leg. The first few miles were roads and paths as the route led onto the Ridgeway before a steeper section as you got into top of the Ridgeway and then it was a series of undulating terrain. Stouty did a great job keeping the conversation going and keeping me motivated (thanks buddy!) although my legs were really starting to feel it and I found it more difficult to consume food as my body started to reject it (I started to convulse slightly when I tried to eat something). I found fruit to be the most palatable of foods to digest because its largely liquid and has a nice sharp taste and I started to survive on tangerines, melon slices and grapes primarily but I knew I wasn’t eating as much as I normally do. We ran/walked/hiked towards the interim Checkpoint being marshaled by Rich Cranswick (in Chicken costume) and a few others. It was a brief stop for a cup of tea (which I managed to immediately knock over first time) and then we pressed on. I was started to feel the need for a toilet break to the extent I was having a slight stomach ache but I was hoping to get back to the comforts of Race HQ rather than go ‘Al Fresco’. We jogged/marched/plodded to Chain Hill to see Barry Miller, Martin Pether and a few others and headed back quite quickly past Stuart March taking some pictures near the monument. Stouty kept me moving, kept prompting me to run and I generally responded to this despite aching legs and a nervous stomach. I was looking forward to some hot food and drink at 75 miles as well as a visit to the toilet. We marched the last couple of miles towards the checkpoint passing Drew and Claire on Streatley Bridge who asked if I could at least run as I approached the Checkpoint to tease Nici. That was always the plan Drew…. always the plan, regardless of how I felt. I arrived back in the Checkpoint at 11pm and immediately dashed to the toilet (ahhh relief) and then tried to eat some chilli and bread which Gary handed to me as Ashok helped me with my bottles. I tried to eat the chilli, nibbled on some bread but couldn’t really consume anything at all and headed back out for the final push. Stouty was leaving me here having pushed me along leg 3, it was just my hometown stretch now. Nici popped up again. Swore at me (not in a harsh manner) and then hugged me acknowledging that I was having a good run and admitting that at some level she was pleased I was doing well which was a kind and honest comment. It was fair to say that as I was working my way through Aid Station and passing other runners whilst there was loads of support for “The Hat”, it was clear that people really wanted to Nici take on a big race next year and my own run was secondary to be fair. In a perverse way it showed the admiration and respect people had for Nici due to all her contributions and efforts towards the UK Ultra running scene (not just Centurion events but also other events you have crewed at and supported) and there was a huge number of people who would be happy to support/crew/pace Nici if she had to tackle her challenge. The last stretch of the race is pretty familiar with the few miles in Reading running past my workplace and lunchtime running territory and this leg would be completed in the dark. The checkpoint at Whitchurch was run by a group of groovy hip funksters in 70’s style fancy dress and I passed through quickly, over the bridge and onto the fields towards Mapledurham. From there I followed the familiar path through the streets of Purley and towards Reading, down the steps by the Pub and back onto the Thames Path. The tall grinning form of Marco Consani passed me at this point and I gave him a wave. By this point he had a commanding lead as it was a little while later that Ed passed me on his way to the finish. The rest of the route to the Aid Station followed my usual lunchtime run and I plodded my way along the well lit path past the Boatyard, my office (which was a little strange seeing it at 2am in the morning), Tesco’s and finally over the horse-shoe bridge to the turn point at the Boatyard. By this time the top ten runners were on their way back and Dave Ross, Sarah, Paul Radford, Debbie Martin-Consani and a couple of others had all passed me. I counted the number of runners on the way back which confirmed I was in 9th place and when I got to the Aid Station unusually I was the only person there and had silver service treatment from the couple of volunteers on hand at the time. I passed Wendy and her pacer Adrian through the streets of Purley and then trudged slowly through the fields in Mapledurham which were now wet with puddles and getting quite muddy and I was quite pleased to see Whitchurch bridge illuminated in the distance meaning I was about ½ mile away from the last Aid Station. At this point a runner passed me in the opposite direction and asked where the aid Station was. I paused and said about 7-8 miles and he then realised he had missed the Whitchurch Aid Station and he over-reacted a bit by swearing profusely and cursing his luck and swearing blind that markings must have been removed. I guess emotions were running high at that point as I suggested he had better re-trace his steps and gave him some directions back. A few minutes later I arrived at the Checkpoint to find the markings were in place and I spotted the same runner passing me having retraced his steps back to the Aid Station and back on the correct path. It was a good example of the highs and lows experienced during an Ultra showing sometimes how small things can really trigger an strong emotion in runners. In all honesty, there had been no running for the last couple of miles before the Whitchurch Aid Station. I saw the funky groovsters again and paused briefly and sat down (I may have had a cup of tea) for a few moments before realising I was just wasting time and I thanked the guys and headed out for the final few miles to the finish. Looking at my watch I was on for about a 19 hour finish which would be a new PB by 30-40 mins which was good but I couldn’t help feeling that there was a bit more to give and if I could have motivated myself to run a bit more of those segments then there’s a little bit more of improvement to come. It was a slightly surreal position that I was well under my target and at some level didn’t feel the need to have to work any harder now. I suppose after 18+ hours of exercise you can be excused for slacking off a bit. I followed the wooded section and couple of hills away from the river taking care to avoid the tree roots covered by fallen leaves in the dark. By this point, I hadn’t been caught by any of the three runners who were seemingly close behind me on the turn and whilst I assumed that they would catch me earlier and I probably would have just let them run on, I now felt the desire to defend my top ten position and gradually I started sneaking in short running segments even if it was a 50 metres here or there or perhaps longer on a downhill stretch. By the time I got to within a couple of miles of the finish I didn’t want to be caught and with the clock ticking over at 18.30, I really wanted to sneak under 19 hours (18.5x something sounds so much better than 19.0x hrs something) and started to jog a bit more through the fields and various gates and back onto the path. It was still completely dark as it was approaching 5am in the morning and Streatley Bridge took an eternity to appear but as soon as I saw it I broke into a sustained jog (which felt harder than it possible should as I was feeling out of breath despite the fact that it was no more than 10m/m pace for a few hundred yards) and ran into Goring Village Hall for the final time in 18hrs 56mins and holding 9th position despite struggling a bit on the last leg. “The Hat” was victorious! Nici was at the finish and we exchanged a hug and a few words (I can’t remember what we said now but we were back on very friendly terms following the earlier mock banter). I felt an overwhelming desire just to sit down on the floor which I did for a few moments before collecting myself and then being awarded my finishers buckle and Grand Slam finishers’ buckle which was almost an afterthought after the bet and the Hat banter during the race. I sat down had a cup of tea and got changed and briefly reflected on the race. 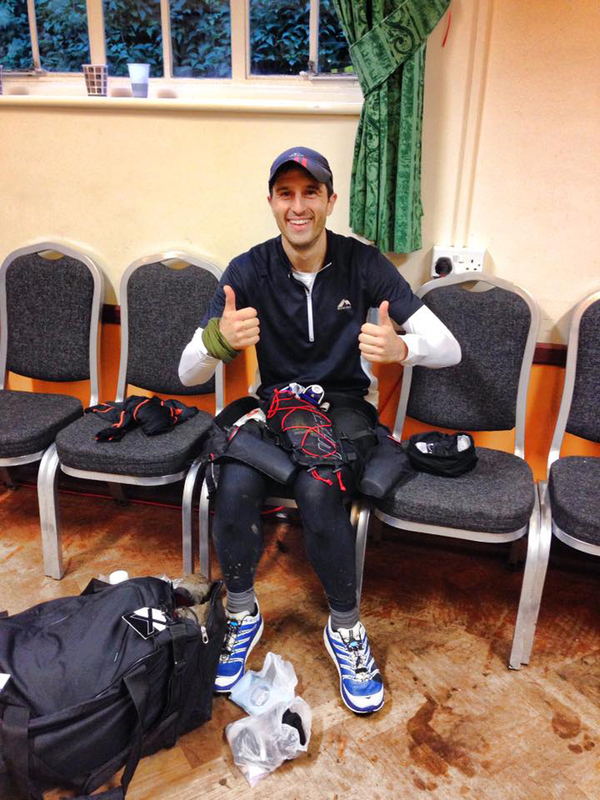 A new 100-mile PB, sub 19 hours, my first top 10 position at a Centurion race and completing the Grand Slam all in the same race. It was a bit of a dream outcome and a far cry from some poor efforts in my last couple of races less than 2 months ago. I guess it shows what can be achieved with a bit of motivation! We were fortunate that the weather was pretty good and although there were a few areas where ground conditions were slippy the course was in pretty reasonable running condition overall. A final word on the Centurion Grand Slam. There were 41 Grand Slam starters at the Thames Path but unfortunately only 16 people managed to complete all four events. Dave Ross dominated the Grand Slam finishing in a combined time of 70.03 followed by Warwick Gooch in 78.35, the consistent Peter Bowles 80.12 and then myself in 83.57. I had actually managed to get myself closer to my pre-year target of 83 ½ hours but still needed another half an hour from somewhere and it was a little too much to do after that shoddy effort at the NDW. Well done to all of the Grand Slammers in 2014, it was great to see you all during the year! Thanks to the Centurion team and the army of volunteers who supported the race once again, well done to the runners and in particular thanks to Nici for being such a great sport during the event (and afterwards by contributing a few words towards the write up) and giving me the motivation I needed to have a decent run and finish the Ultra running season on a high. 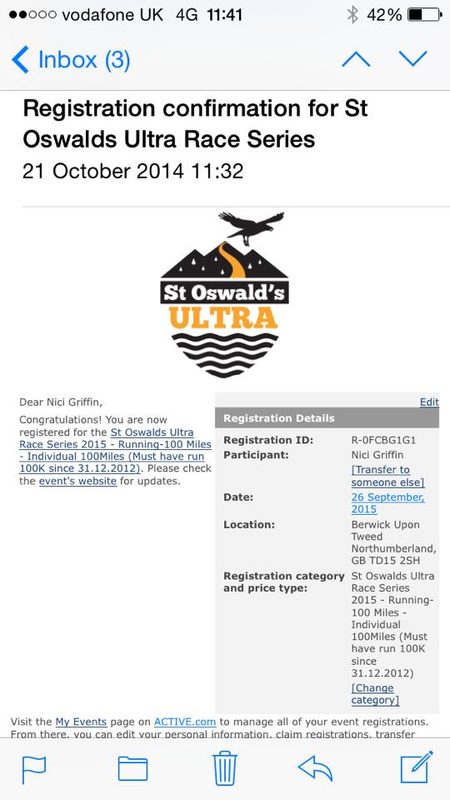 St Oswalds Ultra has been nominated as the forfeit so runners book up the race and volunteers put the date in your diaries! I’m sure by now you are quite bored if you have read Paul Ali’s version of events (hey! It’s comedy gold up there ^) but I feel it’s only fair to give my side of the story. I’m not a superstitious person. I’ve never rubbed a rabbit’s foot (they’re hard to catch), I don’t ‘knock on wood’ and I smash mirrors for fun. I am under no illusions that The Hat has any special weather powers. Let’s face it, it’s England – it rains. However I love a bit of banter and I love our Paul Ali. So it just seemed natural that him and I would fall into friendly back and forth banter/insults/threats about the hat. 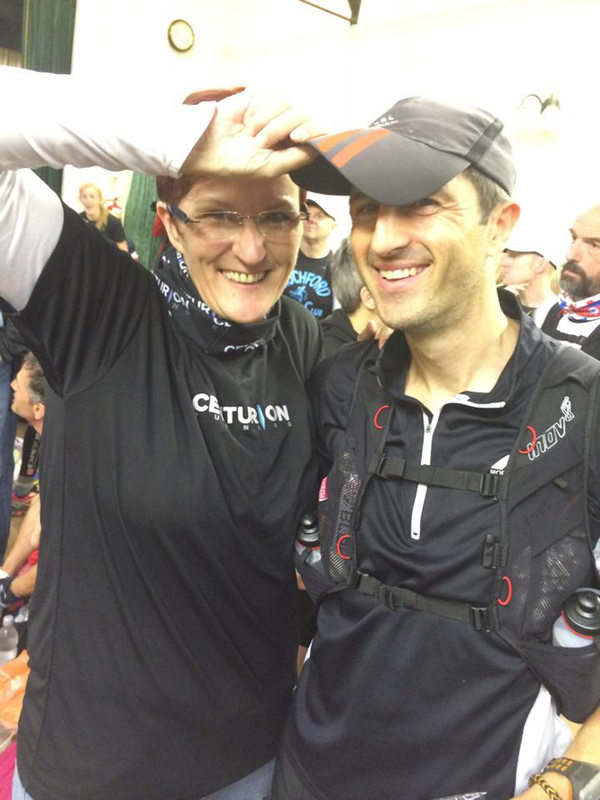 If you’ve read my pitiful blog you may remember that at Endure 24 he even tried to bribe with said hat if I completed another lap but at 65 miles I was broken and I hated him, his hat and all things ultra. I got over that in 26 hours and signed up for another 24-hour race though. In the lead up to the Winter 100 I wanted to, in my own silly way, give Paul something fun to think about. He’s had an incredibly busy year and quite shockingly his first ever DNF at the T184. I hadn’t spoken to him in person so wasn’t sure if this had ‘messed with his head’ but I just wanted the last big one for 2014 to have a bit of fun attached. So I joking said “Bet you can’t run a sub 20 at W100” and goaded him that if he didn’t manage it then I was going to get The Hat. Anyone who knows me will attest that I have ZERO desire for 100 miles. Zero. It’s ok though. It was a sure bet. But this was a sure bet for me. 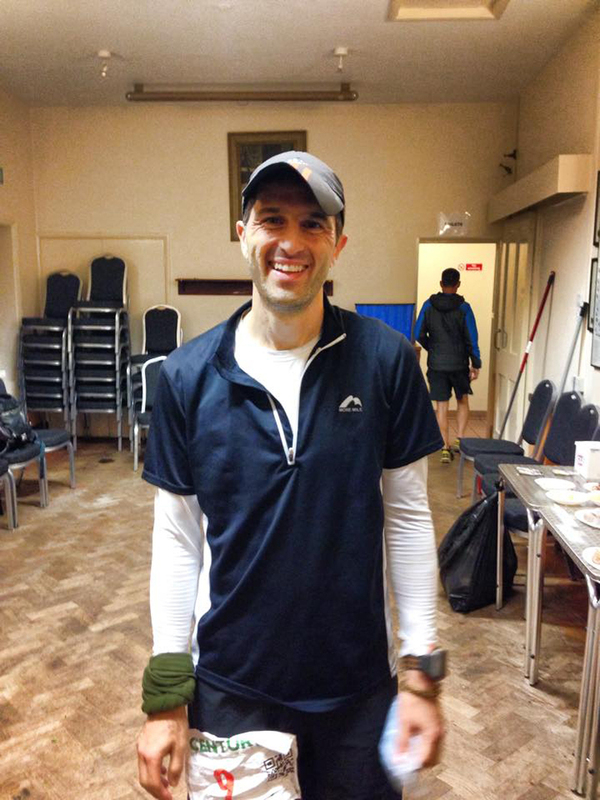 Paul’s best 100-mile time is 19:36 at this years Thames Path 100. Perfect conditions. Not the predicted deluge that was on for this years Winter 100. He’d never do it. He’s had an event filled year. Tired legs and crap weather were in my favour. So it was with ease I said “Sure, whatever”. Then before I knew it there was a bit of a social media flurry on it. I was getting lots of messages of support and offers to pace/crew me. Excuse me? I’m not losing!! It was a sure bet. I won’t go into the details of Pauls race (note the aforementioned bored factor) but will tell you that it was a great day from start to finish. Although I do think he dealt some low blows. The first being that when he arrived for registration he informed me his little girl had asked him to not lose the hat! Low blow Ali, low blow. So I of course was very mature and countered by telling him that we had already purchased the petrol and the hat would be burned in the middle of the road outside HQ. Now for those who don’t know the format of the W100 is 4 out and back legs of 25 miles so I knew I would get to see Paul 4 times (including the anticipated 22 hour finish). Before they even set off on leg 1 I had total strangers asking me how I felt about a 100 miles, had I picked a race yet, what was I thinking etc. Whatever. It was a sure bet. I wish I could say that once the race was under way I had put it out of my mind due to being so busy at HQ but it was here that the first major blow to my confidence happened. I started recalling conversations at dinner the night before with the event crew and some friends. James Elson looked at me and said “He’ll do it you know” and then the whole table gleefully started making suggestions for my 100 miler. Fabulous! It was maybe a sure bet. I have never been so frustrated in my life when the race leaders Marco Consani and Ed Catmur came flying into the hall at the end of leg 1. First thing Marco said was … “The hat looks good”. So when Paul comes skipping in I just stared at him. I was not chanting in my head about him tripping up. Honest. I did love though that so many runners at both the sharp end and the back of the pack were joining in the fun (or rather my misery). I was still quietly confident that the weather and night time would send things in my favour. Bloody wish I’d taken Paul Stout up on the bribery offer though as he was going to be pacing him on leg 3. It was not a good sign when Stouty got there early for his duties because he had noted on the tracker that the bloody hat was rocking along ahead of schedule. 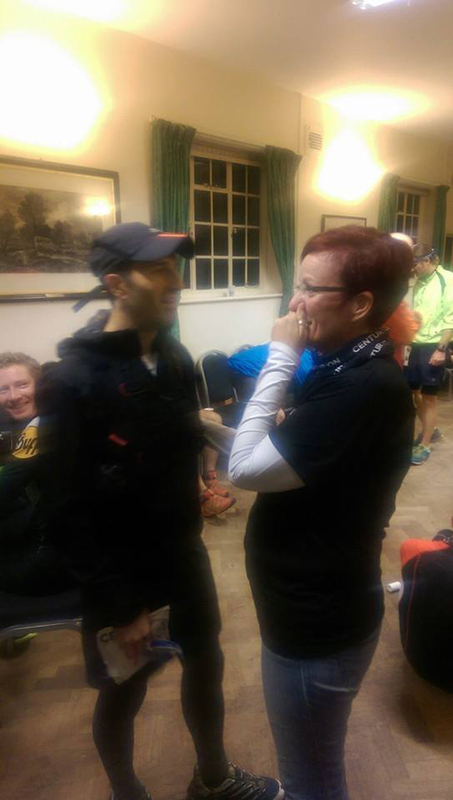 My stomach dropped when Paul came breezing into the hall looking like he was out for a Sunday jog and announced he has just made a 50-mile PB. I tried to persuade Gary (Kit Check Captain) to perform an hour-long details mandatory kit check and evaluation. He was too busy confirming the mileage for the West Highland Way to hear me. That’s ok. It was a kind of sure bet. By now I am genuinely worried and start praying (thanks for capturing that Gary). The ever-supportive HQ crew were doing their best to console me by gleefully researching on the HQ laptop what races I could do!!! Every time I went back to it there was one left up on the screen. 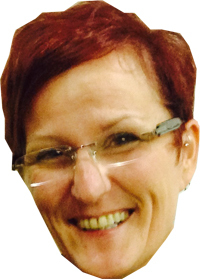 I was even now being drawn into conversations of what kind would I like to do, why I can’t do a Centurion one, who would be on the crew ….. thanks so much for the solid support! Although on the bright side I did hear one runner say he had fallen almost taking the hat out with him! That cheered me. End of leg 3 that stupid hat and its bloody owner came into the hall and my heart softened just a little bit (don’t tell anyone) as he looked a bit pained. As he sat there I couldn’t help but give him a massive hug and tell him that I wanted to be angry but I couldn’t as I was so bloody proud of him. He was absolutely on for getting a PB and ending his year in the right way. On a high. It seems the HQ team were too busy to console me as they were deciding between West Highland Way (with Elson offering to run an extra 4 mile loop with me to make up the distance), Hardmoors 110 and St Oswalds Way for me. How kind of them. What happened to team Nici? It’s still ok. I could deny the bet right? After all I would never encourage gambling. No? 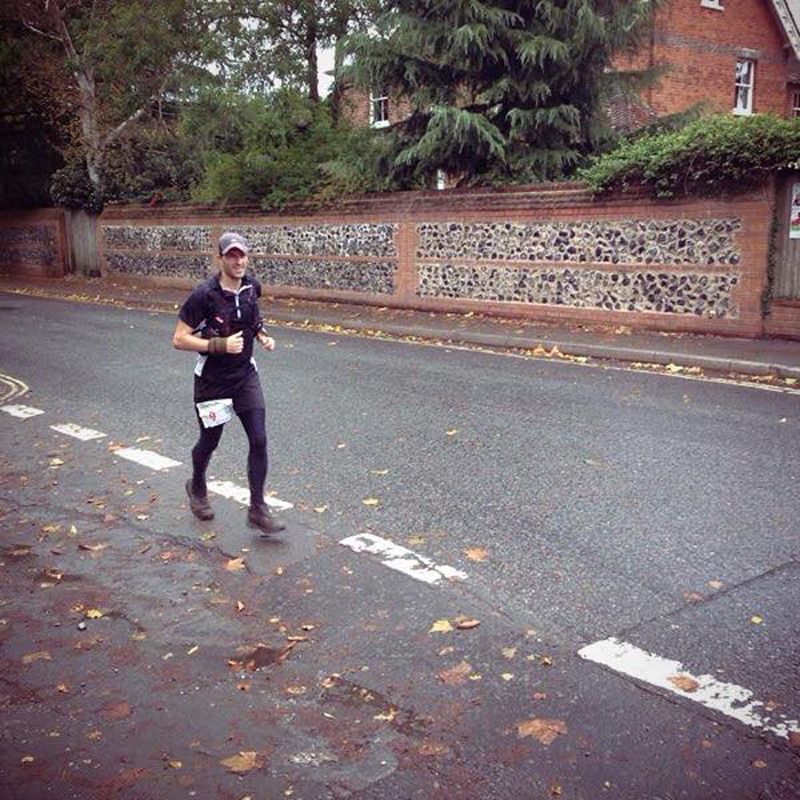 I will be honest and say it was at this point I resigned myself to the fact I would be taking on a 100 miler in 2015. Now anyone who knows me will agree that I love every one of our runners from the folks at front on fire, to the ones playing with cutoffs and to the ones who end their day early. Each and every one of them is part of my extended family whether they like it or not. Yet now I hated them as they came in the hall in differing stages of pain, joy, tears etc … it scared me. What have I done? Oh well. It was a bet. When Paul came in at the end of his 4th leg I was standing waiting for him. What an amazing time. 18:56 !! I hugged him and quietly told him that I could not be prouder of him. I was not going to cry. Nope not me – I’m made of ice water. I then felt a bit sick. There is no such thing as ‘A sure bet’. I must be the last person to realize that little gem. Now I know there are many who are thinking that surely Paul would not hold me to the bet. After all 100 miles is a crazy thing to have to do for the sake of a silly friendly bet. Small problem is that I would have absolutely taken the hat and burned it if I had won. A bet is a bet. I have now officially taken on a coach. I have entered a race. I have made out my will. I will continue to hate that hat. Thanks Guy, “The hat has reached its peak”… well played sir!